The weather outside is still frightful where we are, making it hard for kids to get the exercise they need. I’ve talked about ways to give your kids exercise before, but I started thinking that I wanted another option. Kids can control the intensity of the workout with pace. Less fit kids can go slower. It uses only body weight and no equipment besides stairs. It’s hard. One of the things I don’t understand is why kids’ exercise videos are so easy, they won’t even sweat, when a simple game of tag that kids play all the time is enough to wipe me out. It’s quick. It takes 20-minutes to do the entire routine or 10 to do just one round. First let me say that I am not a physician or personal trainer. I didn’t create this routine nor can I say that it’s safe for you or your child. Please make sure you are cleared by your doctors to do these exercises and STOP if you are in pain and not just tired. 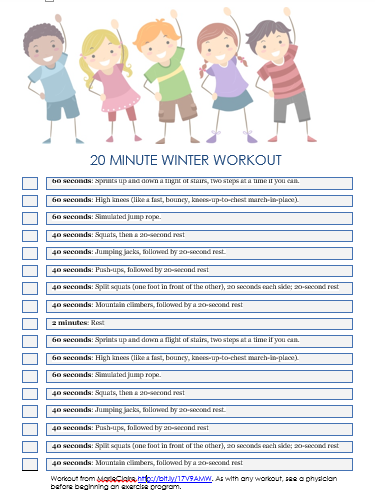 If you would like to give your kids (and yourself) a good quick workout during these cold winter days, print it out and give it a try. I laminated mine so kids can check off each step and reuse it. You will need to have a timer of some sort handy (iPods or smart phones work great). Finally, you may want to play some upbeat music! Make it fun and kids will want to keep exercising. 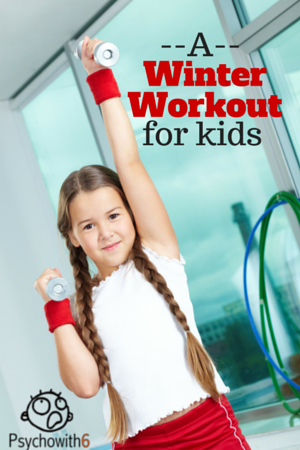 What other ways do you use to keep kids fit in the winter?